The text comment block is exclusively used for program documentation purposes. It is possible to enter a text up to 255 characters (including new lines). With the help of the clipboard, texts can also be inserted out of other applications. Larger texts are cut off automatically in this case. 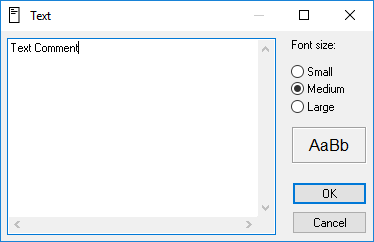 You can choose between three font sizes. The parameter dialog is used to enter the text comment and to select the font size. It can only be opened in edit mode.